Dogs in Tutus: Do You Plant Other Things With Your Trees? I read somewhere that ringing a majestic tree with a base of flowering annuals is like forcing your dog wear frilly underwear or a tutu. Something like that. 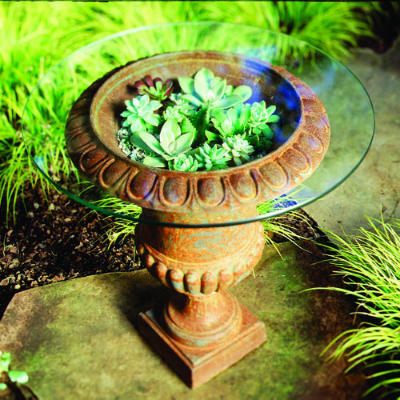 Now ever time I a ring of impatiens or begonias around the base of a tree, I laugh. 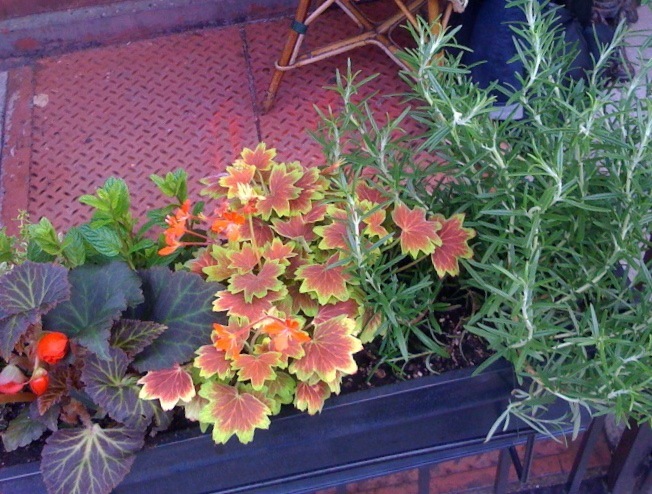 But, we do have flowers planted along with the few small trees that we have in our roof garden. We just have so many plants we want to grow and just a few containers. 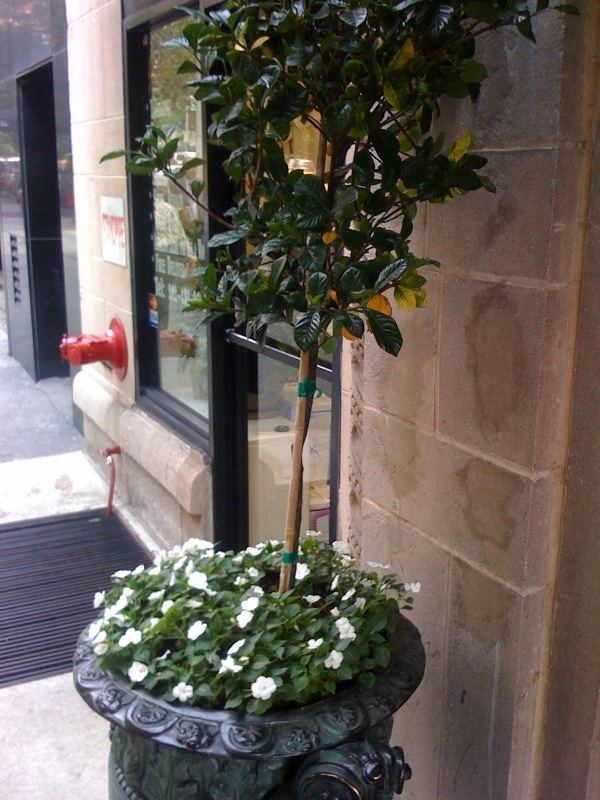 What do you think about flowers under potted trees? 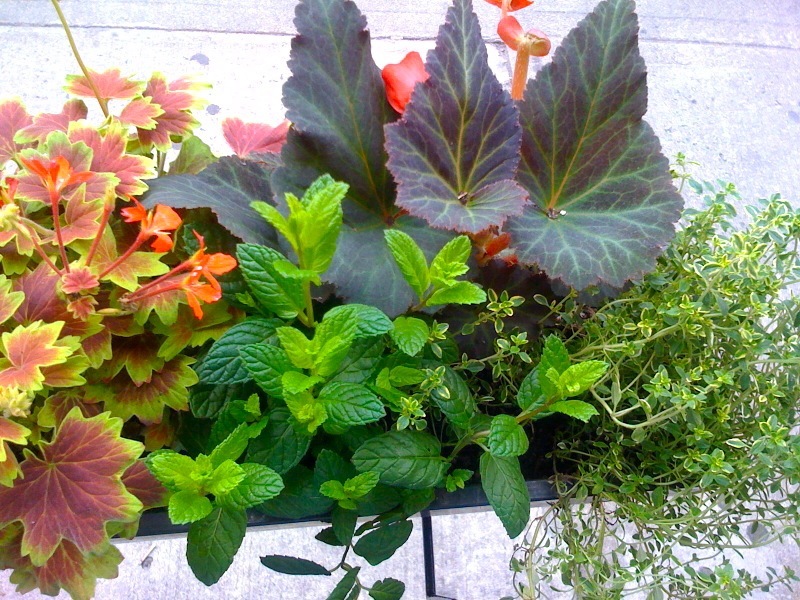 Cool blue container garden inspiration, fresh from the West Village. 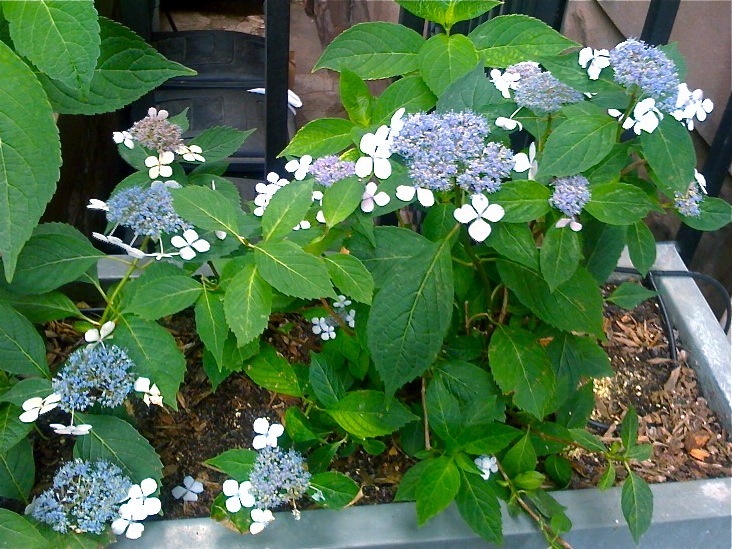 I’m thinking about adding a hydrangea to our roof garden next year. 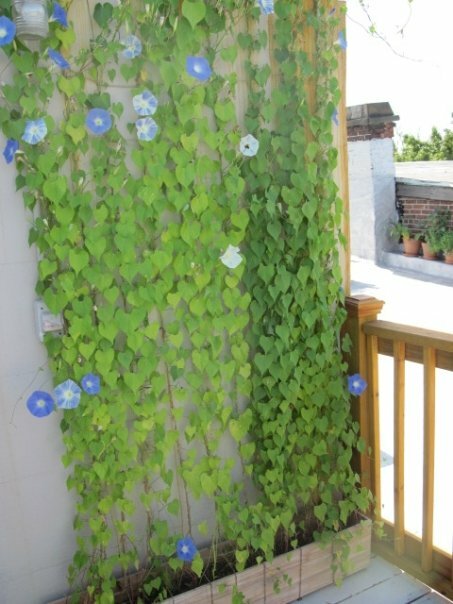 Check out M & P’s stunning wall of morning glories. Last spring, they built their own trellis and trained the vines to grow up a roof garden wall covered with rust stains. This is a great example of turning a challenge in your city garden space into a feature. The wall gives these vines some shelter from wind and full day sun. 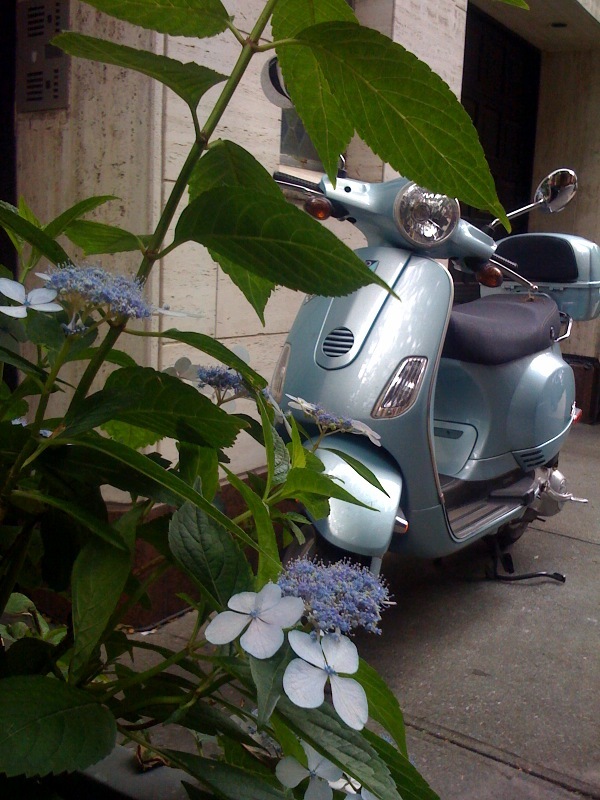 For more pics of this Jersey City garden, check out my post from last summer. 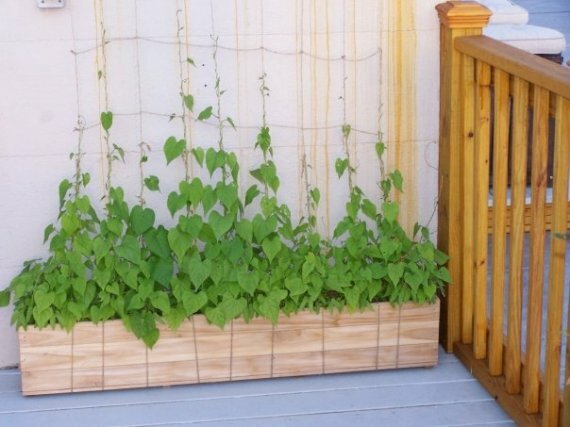 If you’re growing vines on your roof garden, please let me know and send some photos if you can! 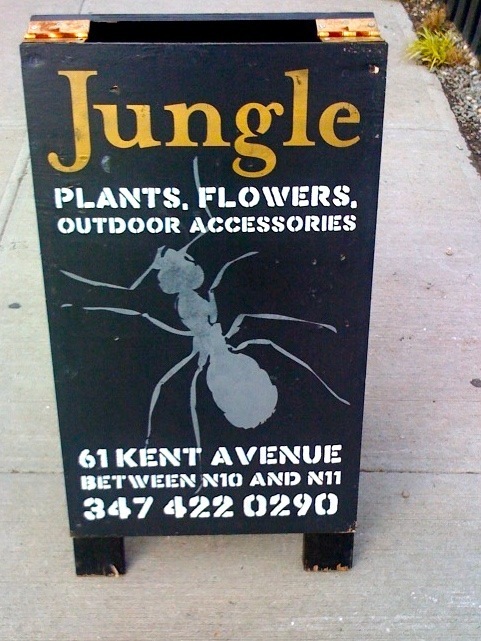 Got out of work early on Friday and made a beeline to Brooklyn to check out the Jungle Garden store at 61 Kent Avenue (between N. 10th and N. 11th). Do you know another garden center that plays dance music? The place has an approachable, energetic feeling. 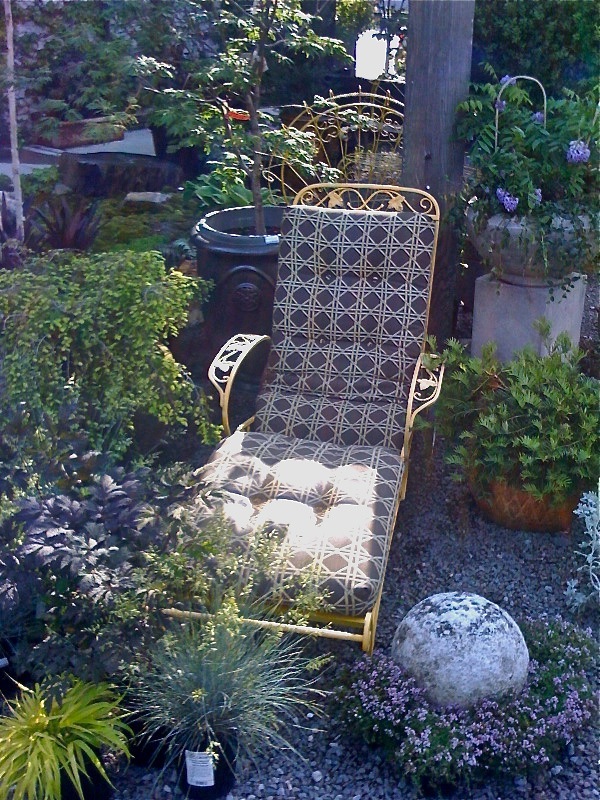 I was so ready to lay back in one of the vintage lounge chairs and cruise their huge variety of plants. 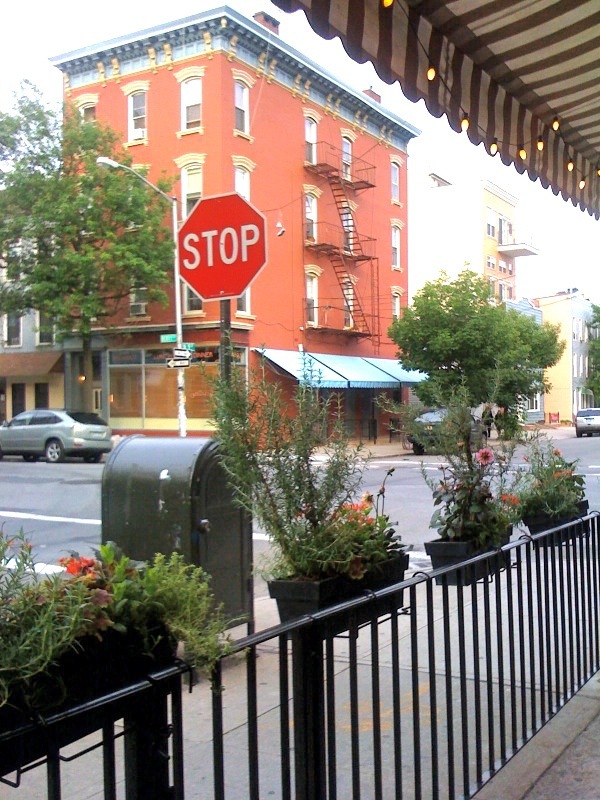 They have a smart collection of Brooklyn-friendly plants like succulents and roof garden friendly plants including grasses and the purple salvia I picked up. 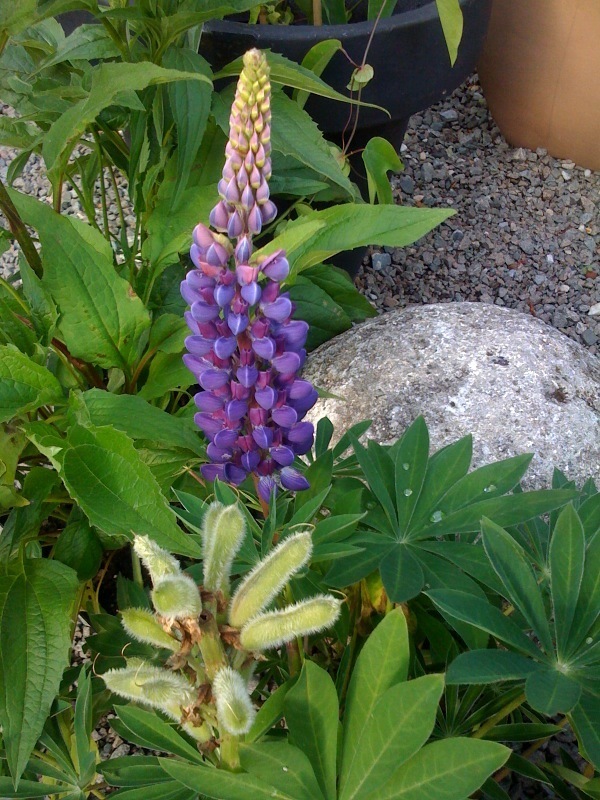 Lupins need moist soil and protection from summer winds – so they aren’t a fit for our roof garden. Still, a stunning plant to go visit. 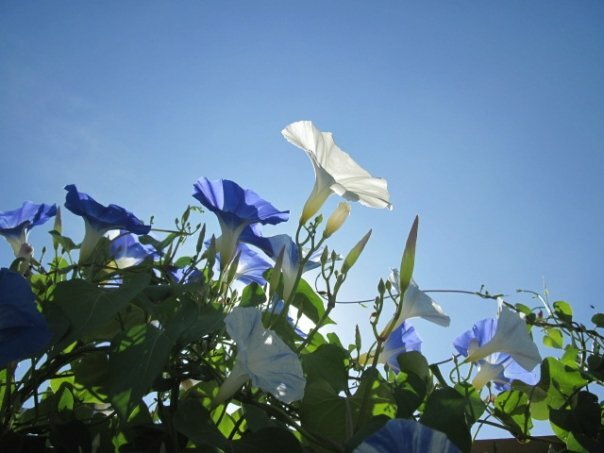 The vision was a night garden, of sorts, with white flowers on the moon vine and in the hanging basket above. We wanted vines to soften the space. 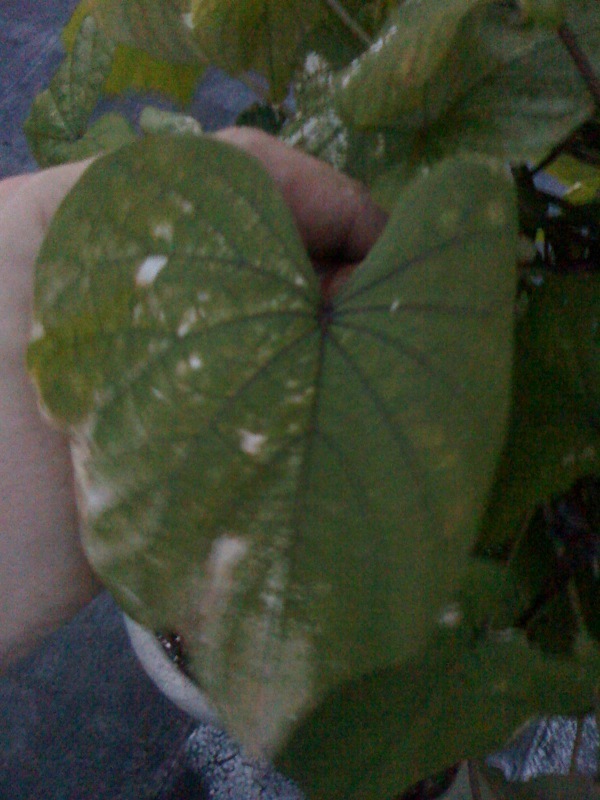 Instead, the moon vine got these spotted leaves and just looked sad. My mom think I over-watered it. I wonder if it was too windy or the pole got too hot. 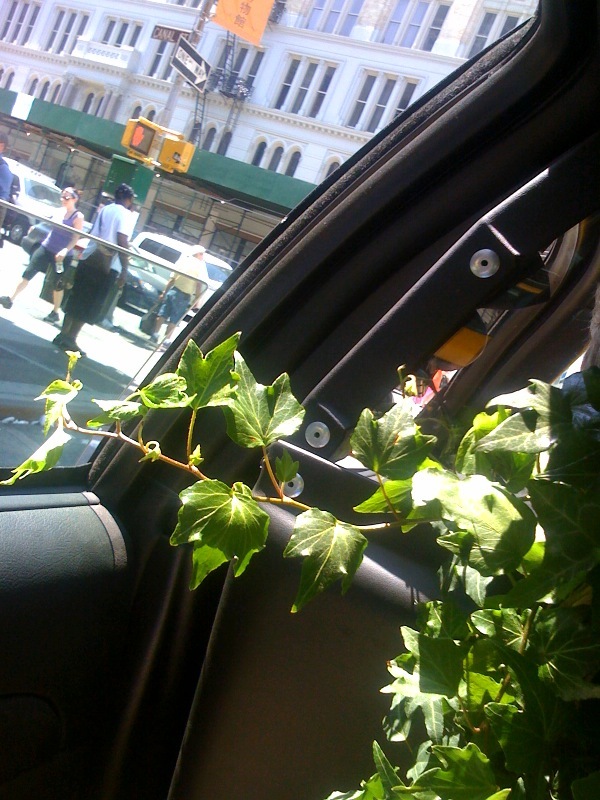 We replaced the moon vine with this stunning English ivy trained up a trellis from a flori$t in the West Village. We planted three geraniums with vinca vines at the base. 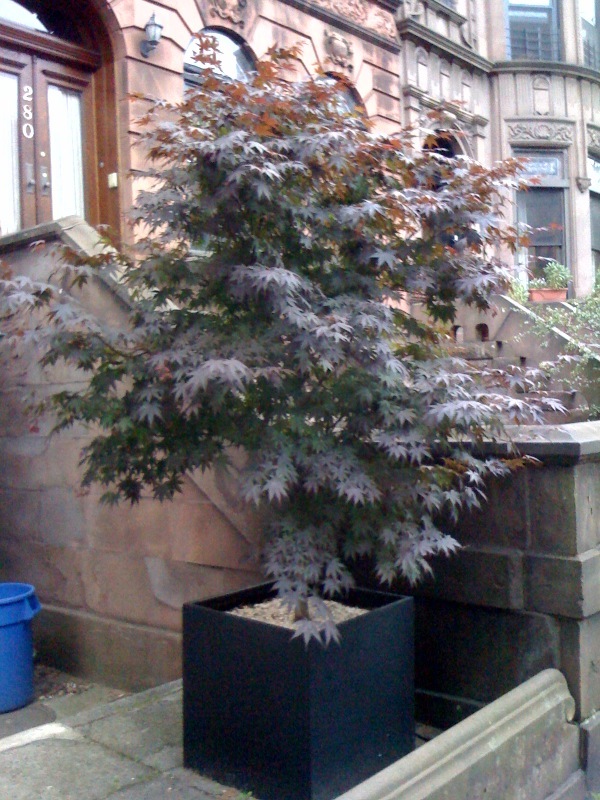 The new planting — we’ll get some pix once it settles in a bit — feels a bit formal for our garden and rather Republican somehow. But R* and I both like geraniums, they remind us of his mum’s back garden in England. They also grow amazingly well in sun-soaked containers.